From the late 12th century, Final Concords (or Fines) were a court procedure for ending a legal action by agreement between the parties. Originally this was a means of resolving genuine disputes, but in the medieval period there was no central registry to record land conveyances and help prevent fraud so lawyers used Fines by turning the land sale into a fictitious legal dispute between the parties to the sale. The Purchaser was referred to as the querent, the Seller as the deforciant or impedient. From 1195 the procedure was that three copies of the Fine were written on a single sheet of parchment. The copies would then be separated by cutting the parchment along wavy lines as a precaution against forgery. The left and right side copies were given to the parties and the third copy, at the foot, was kept by the court. Not surprisingly the court copy was known as a ‘foot of fine’. The bureaucratic process could mean expense, delay and inconvenience but the court copy made the agreement much harder to challenge than one recorded only by a charter. They were also democratic in that a woman could be party to a Fine. The Feet of Fines records are arranged by year and by the four law terms, Michaelmas, Hilary, Easter and Trinity. Final concords were eventually abolished by the Fines and Recoveries Act 1833. These are abstracts from the ‘Feet of Fines’ archived at The National Archive in Kew, England relating to Bosbury. Date: The day after St John the Baptist, 8 Edward II [25 June 1315]. Parties: William, son of Reynold de Galby, querent, and Robert de La Halle of Bosebur’, deforciant. Property: 1 messuage, 18 acres of land, 1 acre of meadow and 7 shillings of rent in Bosebur’. For this: William has granted to Robert the tenements and has rendered them to him in the court, to hold to Robert, of William and his heirs for the life of Robert, rendering yearly 1 rose at the feast of the Nativity of St John the Baptist, and doing to the chief lords all other services. And after the decease of Robert the tenements shall revert to William and his heirs, quit of the heirs of Robert, to hold of the chief lords for ever. The National Archives record CP 25/1/82/31, number 49. Parties: John de La Barewe of Stanford and Alice, his wife, querents, and Joan, daughter of Isabel de Stanford’, deforciant. Property: 2 messuage, 3 carucates of land, 11 acres of meadow, 10 acres of wood, 4 acres of moor and 4 pounds and 7 shillings of rent in Stanford’ Ep’i, Bosebury, Credeleyeshide, Esebache and Frome Ep’i. Agreement: John and Alice have acknowledged the tenements to be the right of Joan, as those which she has of their gift. For this: Joan has granted to John and Alice the tenements and has rendered them to them in the court, to hold to John and Alice and the heirs of John, of the chief lords for ever. The National Archives record CP 25/1/82/33, number 133. Date: Two weeks from St Martin, 4th year of Edward III [25 November 1330]. Parties: John, son of John de Stanford’, and Margaret, his wife, querents, and John de Stanford’ and Alice, his wife, deforciants. Property: 1 messuage, 1 virgate of land, 1 acre of meadow, 4 [acres] of wood and 20 shillings of rent in Bosebury. Agreement: John, son of John, has acknowledged the tenements to be the right of John de Stanford, as those which the same John and Alice have of his gift. For this: John de Stanford and Alice have granted to John, son of John, and Margaret the tenements and have rendered them to them in the court, to hold to John, son of John, and Margaret and the heirs of their bodies, of John de Stanford and Alice and the heirs of John for ever, rendering yearly 1 rose at the feast of the Nativity of St John the Baptist, and doing to the chief lords all other services. In default of such heirs, the tenements shall revert to John de Stanford and Alice and the heirs of John, quit of the other heirs of John, son of John, and Margaret, to hold of the chief lords for ever. The National Archives record CP 25/1/82/37, number 20. Date: One month from Easter, 5th year of Edward III [28 April 1331]. Parties: Thomas, son of Thomas de Jaye, and Margaret, his wife, querents, by Richard Russel, put in the place of Margaret by the lord king’s writ, and Walter, the parson of the church of Brocbury, deforciant. Property: 3 messuages, 1 carucate and 2 virgates of land and 8 shillings and 2 pence and 1 halfpenny of rent in Byford and Cotynton by Bosebury. Agreement: Thomas has acknowledged the tenements to be the right of Walter, as those which Walter has of his gift. For this: Walter has granted to Thomas and Margaret the tenements and has rendered them to them in the court, to hold to Thomas and Margaret and the heirs of their bodies, of the chief lords for ever. In default of such heirs, remainder to the right heirs of Thomas. The National Archives record CP 25/1/82/38, number 39. Herefordshire placenames given are probably Brobury and Coddington (the latter a parish adjoining Bosbury). Date: One week from Holy Trinity, 10th year of Edward III [2 June 1336]. And afterwards one week from St Michael in the same year [6 October 1336]. Parties: Richard Wyther of Walinton, querent, and Robert Moryn and Isolde, his wife, impedients. Property: 1 messuage, 1 virgate and 12 acres of land, 1 acre of meadow and a moiety of 1 mill in Upledene. 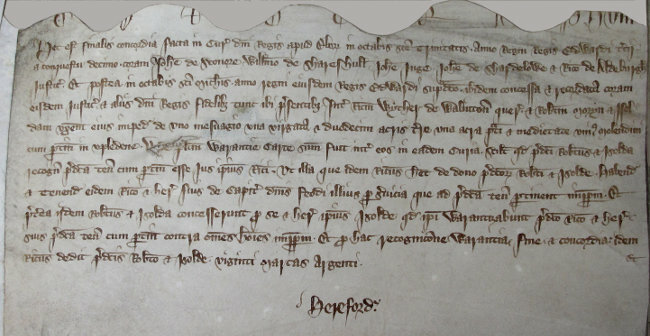 Agreement: Robert and Isolt have acknowledged the tenements to be the right of Richard, as those which he has of their gift, to hold to Richard and his heirs, of the chief lords for ever. Warranty: Warranty by Robert and Isolde for themselves and the heirs of Isolde. The National Archives record CP 25/1/82/40, number 76. Herefordshire placenames given are probably Wellington and Upleadon (now in Bosbury). The wife’s name Isolde is also sometimes written as Iseult or Isolt. Date: The day after All Souls, 15th year of Richard [II] [3 November 1391]. Parties: Walter Grym, the vicar of the church of Ers[lon]e, Walter Swan, chaplain, and William Lude, chaplain, querents, and John Chamberleyn of Bosbury, deforciant. Property: A moiety of the manor of Middilton. Agreement: John has acknowledged the moiety to be the right of Walter Grym, and has remised and quitclaimed it from himself and his heirs to Walter, Walter and William and the heirs of Walter Grym for ever. The National Archives record CP 25/1/83/49, number 50. Herefordshire placenames given are probably Eardisland and Middleton. Date: One week from St John the Baptist, 8th year of Henry [IV] [1 July 1407]. Parties: Julian Rane, querent, and Richard Ryale, deforciant. Property: 2 carucates of land, 3 acres of meadow, 3 acres of wood and 6 shillings and 6 pence of rent in Bosebury. Agreement: Julian has acknowledged the tenements to be the right of Richard. Richard has granted them to Julian and has rendered them to her in the same court, to hold to Julian of the chief lords for life, and after her decease the tenements shall remain to Richard Heymerssh and Margery, his wife, and the heirs of their bodies, to hold of the chief lords for ever. In default of such heirs, successive remainders (1) to the heirs of the body of Margery and (2) to the right heirs of Richard Heymerssh. The National Archives record CP 25/1/83/51, number 17. Herefordshire surname given is probably Haymarsh. Date: The day after All Souls, 15 Henry VII [3 November 1499]. And afterwards one week from St Hilary in the same year [20 January 1499/1500]. Parties: Thomas Morton’, clerk, Thomas Cornwall’, knight, Richard Cornwall’, Roland Morton’ and John Bodenham, querents, and John Devereux’, knight, and Walter Brokton’, deforciants. Property: The manor of Wotton’ in the parish of Webley, and 1 messuage, 200 acres of land, 16 acres of meadow, 30 acres of pasture and 12 acres of wood in Wotton’, Webley and Fernhall’. Agreement: John Devereux’ and Walter have acknowledged the manor and tenements to be the right of Thomas Morton’, as those which the same Thomas, Thomas Cornwall’, Richard, Roland and John Bodenham have of their gift, and have remised and quitclaimed them from themselves and the heirs of John Devereux’ to Thomas, Thomas, Richard, Roland and John Bodenham and the heirs of Thomas Morton’ for ever. For this: Thomas, Thomas, Richard, Roland and John Bodenham have given them 100 marks of silver. The National Archives record CP 25/1/83/58, number 13. Rowland and Thomas Morton are our Bosbury links.. Particular thanks to David Strutt of Bosbury for locating the Upleadon Fine.